1. The skater style skirt works well because it flows out away from the knee. If you’re going to try it out experiment with different skirt cuts first. It might work with a pencil skirt above the knee too. 2. Show a sliver of skin. Since you won’t have any leg showing, avoid wearing a crew neck shirt. Go for something v or boat necked. This will help your look feel more balanced. 3. Go slim. If your boots are extremely scrunchy, avoid those. Go for a boot that has a more slim and straight look. The ones I’m wearing are on the cusp of being a little too slouchy. 4. Don’t bulk up. The bottom half of your look will feel heavy so avoid heavy jackets or bulky sweaters on top. —Here is another cute way to wear boots under a skirt. 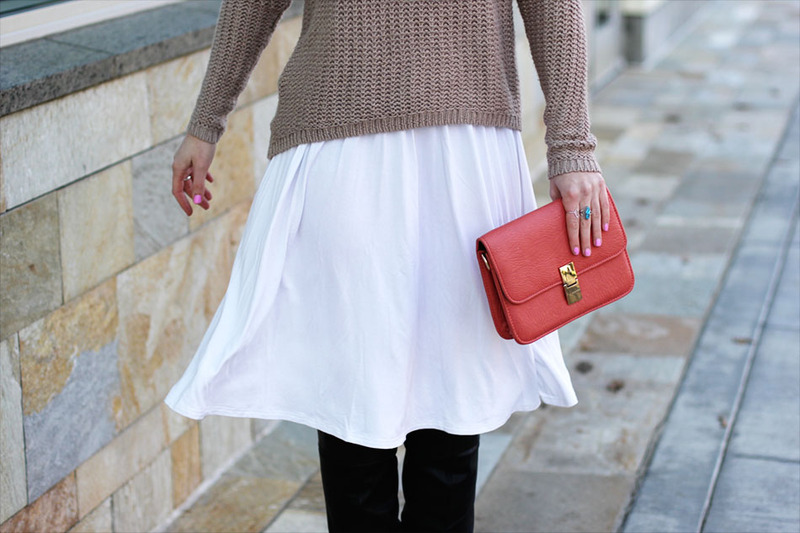 Random notes about the outfit: I never noticed that cream and coral go so well together. New found color palette. BOOM! I am currently recovering from my asymmetrical hair cut and finding way to embrace the current uneven nature of the cut. I’m not too savvy in the hair department so this little twist I have going on is truly innovative for the league I play in. I need to find a youtube channel that just tutorials with short and fine hair. Do you guys have any suggestions? 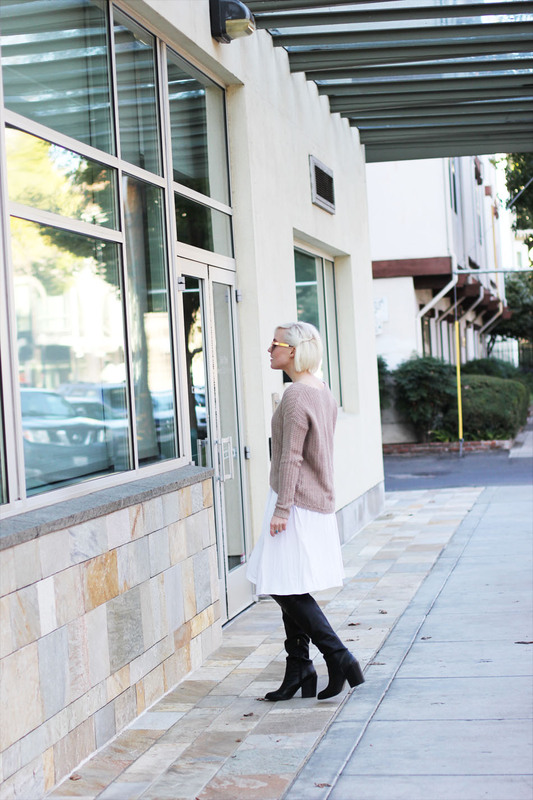 I was on the search for a chunky sweater to layer over dresses and skirts. I never really found what I was looking for. So this sweater is very close to what I had in mind. I love the high low angle it creates. It also nice that it doesn’t have a thick band around the bottom. No one likes when it rides up and creates this sweet fat tire around your waist. I haven’t purchased any new clothing for the whole month of January. This wasn’t intentional but I feel damn good about it. I hate that feeling when you just keeping buying new items because you’re too lazy to remix something in your closet. It can be a slipper slope when you feed off that addiction and constant need for newness. I do my best to fight it but give in occasionally. 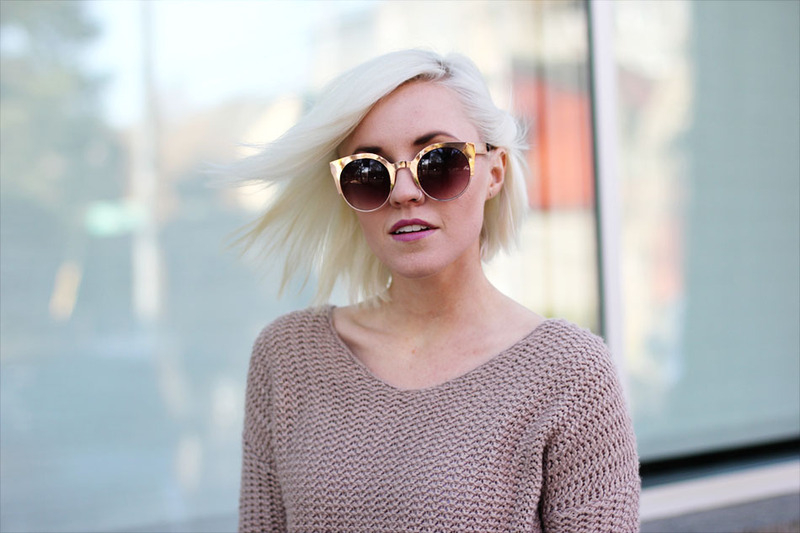 I think fashion blogs get this stigma that all we do is sit around, blog and shop. I guarantee any well curated fashion blog is run by someone who is extremely versed in another segment. Whether it be writing, photography, graphic or interior design, law, public relations, business or marketing. Many people think this is what I do full-time when it’s actually anything but. For me I love having my hands in many different buckets. I would get extremely bored if I spent all my time doing fashion related activities. I need substance to keep me grounded. I crave results after working extremely hard for something. I like split my time up about 60% design work, 30% blog and 10% extra activities. Is this a healthy life model? Probably not. It often feels a bit overwhelming trying to juggle full-time work, freelance design projects and maintaining a blog where I strive to post 3x’s a week and 6x’s/week on Instagram. On the other hand I have the energy for it right now. It has brought many cool people/opportunities into my life. It’s crazy how bountiful life can be when you just put yourself out there and let the fear of failing fly right out the window. Ok enough babbling—have a great week! This outfit look really beautiful.. i love the lose outfit sweaters..!! Like this style with color combination. perfect outwear! Love IT . Like the Color and Hair style .